A volunteer for a local Woking charity, The Lighthouse, which helps families affected by poverty, will have her journey brightened up by in car digital radio when she is providing transport for families attending The Lighthouse’s annual Christmas Day lunch. 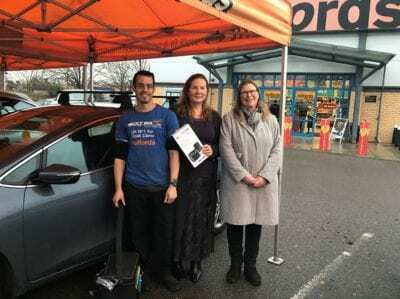 Christian faith-based broadcaster, Premier Christian Radio, has teamed up with radio manufacturer, Pure, to upgrade volunteer Mandy Pennels’ Kia c’eed to receive digital radio stations through fitting a Pure Highway 400 digital radio adapter at Halfords in Byfleet this morning. With the Pure Highway in her car, Ms Pennels will be able to listen to Premier Christian Radio on DAB digital radio, as well as sister stations, Premier Praise and Premier Gospel, along with over 50 stations in Surrey. Ms Pennels is part of the team at The Lighthouse providing a Christmas Day lunch and picking up participants so that they do not miss out. As well as the adapter in Ms Pennels’ car, Pure have also donated a number of digital radios as presents for the people having lunch at The Lighthouse. Premier Christian Radio and Pure are among the partners participating in an in car digital radio pilot scheme which aims to help listeners in Surrey upgrade their car to digital radio, currently being coordinated by Digital Radio UK. The scheme is being supported by Surrey’s popular local broadcasters, including BBC Radio Surrey, Heart Surrey, Eagle Radio, Jack Surrey and Premier Praise, who are letting listeners know where and how they can get digital radio in their car in Surrey in special promotions and features. The Lighthouse provides support for the local community, working with volunteers, groups, and local businesses, to create many innovative projects including a foodbank and toybank, cookery classes, bread-making, and supporting out-of-work women into employment. To find out more about The Lighthouse, go to www.lighthousewoking.org.